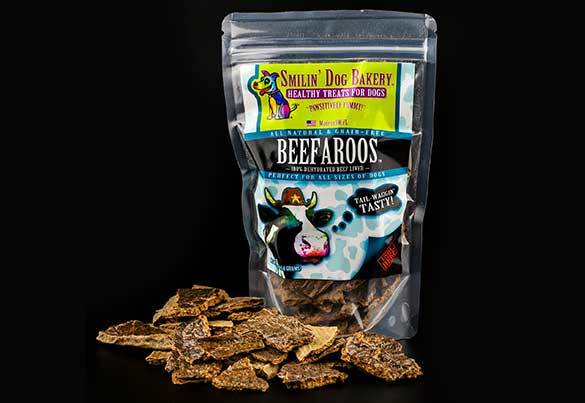 Home/Fido's Favorites/Natural Dog Treats – Beefaroos! Natural Dog Treats – Beefaroos! Our dogs have never been picky regarding treats and especially since they typically only get what I make at Smilin’ Dog Bakery. We are proponents of natural dog treats and raw feeding, and have been for almost one year. Lucy on occasion will lie down beside her “dinner” and refuse to eat unless I sprinkle her favorite treat, Beefaroos! Raw is like caviar for dogs, just lean meat, organ meat and bones ground up into a delicious mush. I guess Lucy looks at it like getting cake without the ice cream? Yep, she’s spoiled!